Starbucks has discontinued its mango and peach syrups, killing its peach green tea lemonade. Fans of the beverage are furious. The syrup was discontinued as Starbucks revamps it tea menu. Starbucks has cut its peach green tea lemonade from the menu — and people are furious. This week, people began posting on social media saying that Starbucks had discontinued its mango and peach syrups. The peach syrup is a key component in the chain's peach green tea lemonade, a beverage with a cult following. At least one person is even calling for a boycott. 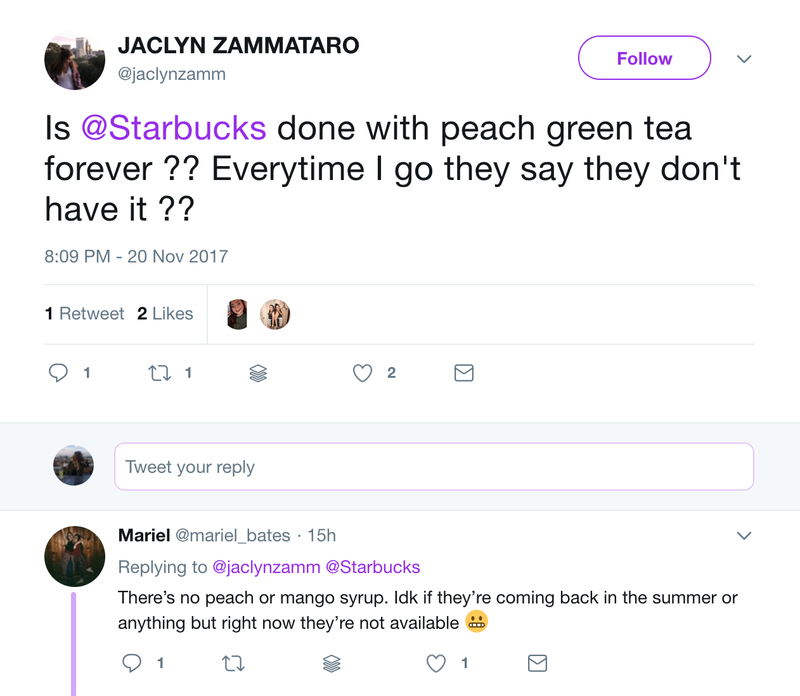 Starbucks confirmed with Business Insider that the peach syrup was no longer on the menu. According to spokesperson Sanja Gould, the peach and mango syrups were discontinued in July with the debut of the new Teavana Shaken Iced Tea Infusions. "As a result of the new approach to flavoring iced tea, peach and mango syrups were discontinued at that time and available only while supply lasted," Gould said. Gould suggested fans of the peach green tea lemonade try the Peach Citrus White Tea Infusion Lemonade or the Pineapple Black Tea Infusion Lemonade. Starbucks is in the midst of revamping its strategy as it attempts to grow tea sales to $3 billion in the next five years, nearly triple its current figures. In July, Starbucks announced plans to close all 379 Teavana stores in the coming year. Earlier in November, the chain announced it had reached an agreement to sell the Tazo tea brand to Unilever for $384 million. States: New York, Pennsylvania, Illinois, Washington D.C.
States: California, New York, Washington D.C.